When it comes to sharing spaces, make it fun for the kids! There are plenty of fun design ideas and unique ways to maximize the function in your rooms for siblings to share. Think about what you need to fit into the space and then work around what you feel is most important. 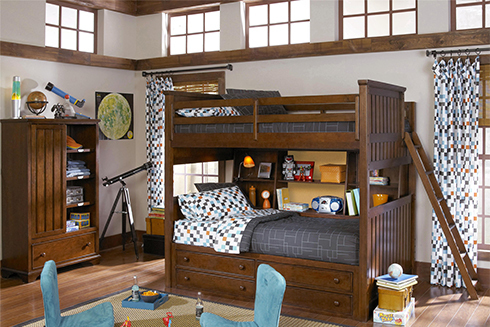 Of course, many people opt to place bunk beds into a small room to maximize sleeping space. Have you seen the latest options for bunk bed configurations? Take a look at some unique combinations including integrated storage and workspace solutions. Storage drawers and open shelving below this bunk bed produce a sweet space for any girls to show-off their favorite collectibles. Underbed storage drawers and a built-in bookcase may not make them stay organized but it certainly will encourage it! Combining shelves, storage drawers, a pin board, and a desk with this bunk bed, Legacy Classic Kids delivers a phenomenally functional piece of furniture perfect for any shared bedroom. Another option, and great style choice, is placing two twin beds together in a room. Simply find a nightstand to separate the two and you've already filled a room with style. This collection may be named 'Guys' but it's an easy choice for a room for girls, boys, or both! Easily add on pieces from the collection for storage like this dresser and mirror. There are always plenty of options to create the room you need. Pairing twin beds is a great option for guests rooms, too! Don't feel restricted by kids furniture or pieces specifically designated as youth collections. These metal twin beds are from Kincaid's Weatherford Collection. A touch of traditional, these beds feature a Jenny Lind-style headboard and footboard. The vintage charm is characterized when the beds are separate but truly comes to life when you bunk the twin beds on top of one another...that's right, these Bellamy beds can combine to become a bunk bed or remain on their own. No worries! If you room allows, try fitting three twin beds together into a room. This is a great option for those larger bedrooms in beach homes or lake houses where you need to fit as many beds as possible. Remember, all of the beds don't need to be on the same wall either. It may better accommodate your space if the beds are on different walls. If you have two siblings sharing a room and will only have the occasional third or fourth guest, a trundle bed is a great option! These extra beds slide under existing beds and are easily hidden after the sleepover ends. For an eclectic feel, mix and match the colors or styles of the beds. This may help towards create a room that's for both girls and boys. If you prefer a more uniform look, pick a neutral hue that's open to decorating in color. There are plenty of hues for you to choose as paint colors or bed spreads for a girls and boys room. Looking for these options and styles – or others? Stop into Belfort Furniture today and speak with our knowledgeable staff to see this and other trends on display in our showroom or available through catalogs! There are hundreds of room settings on display and the possibilities are endless when it comes to creating the perfect home that’s just right for your style.